With 413 National Park areas¹ and over 1,000 Main Street America programs, it’s no surprise that many of the communities following the Four Point Approach serve as gateways to our national parks. It’s also no surprise that the 307 million visits to the parks have huge impacts on their neighboring communities. 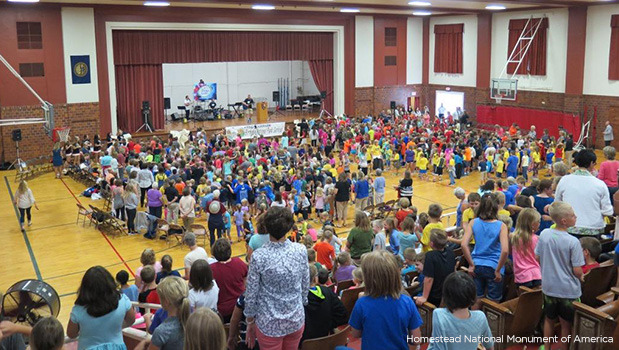 Just over 1,000 school children in Beatrice, Nebraska celebrated the National Park’s Centennial. Because Beatrice is the gateway to the Homestead National Monument, town residents and the Main Street Manager Michael Sothan felt it was important to celebrate the National Park Centennial. The celebration was doubly poetic because Beatrice received its National Register Historic District designation from the Park Service in July allowing business owners to more easily utilize historic tax credits. 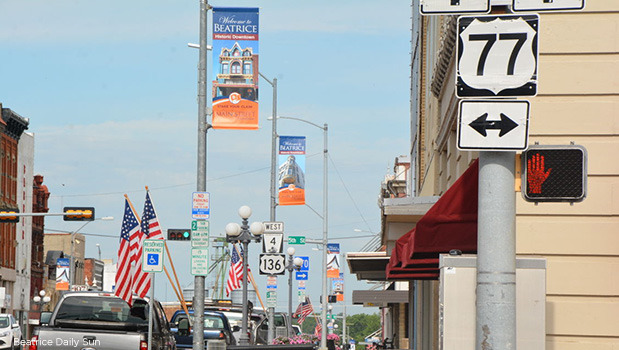 Beatrice Main Street also celebrates the key roles the national park plays in its community and capitalizes on its tourism impact through new banner signs with the ‘Stake Your Claim” tagline. As Beatrice illustrates, the relationships between the National Park Service and these Main Street communities are mutually beneficial. National parks draw millions of tourists through Main Street communities every year. In turn, these visitors support local businesses through their purchases of hotel nights, food and beverages, gas and gear needed to explore our country’s historic, cultural, and natural sites. In turn, Main Streets provide critical visitor services to the parks. We provide hotels, restaurants, gas stations, and stores so that the visitor has a good experience. National parks also can not pay for advertising and Main Street programs help fill that need. They also provide another place for visitors to explore, thereby helping relieve the tremendous burden placed on park sites. According to Ed McMahon, Chair of the National Main Street Center Board of Directors, who wrote Balancing Nature and Commerce in Gateway Communities with Jim Howe and Luther Propst, the “health and quality of park resources generally depend upon their setting within an ecosystem or historic context that often extends well beyond park boundaries.” The quality of the visitor’s experience depends greatly on the aesthetic of the gateway community and the “completeness” of services provided. Also the parks need help protecting natural and cultural resources such as historic buildings within the park, as well as dramatic views of landscapes outside of the park. The Conservation Fund offers annual workshops on how to protect cultural and natural resources, while continuing to grow a local economy. 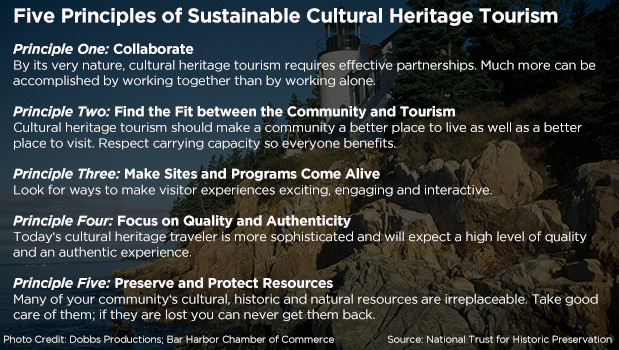 The National Trust’s five principles for heritage tourism highlight the critical importance of collaboration to enhance both the visitor’s experience to the park and creating a viable place to live for local residents. Many Main Streets provide great examples of this collaboration. The city fosters this relationship by always including the Olympic National Park in its marketing efforts because “that’s the destination,” according to Rich Stephens, Administrator for the Port Angles Downtown Association. It also hosts events like a “Gear Up Port Angeles” for Father’s Day which promotes downtown as the base camp for camping adventures in Olympic National Park. In the park’s glacier-capped mountains, rain forests, and over 70 miles of Pacific coastline, visitors explore the different terrains and layers of history – from artifacts left by the area’s earliest inhabitants to the shelters built by the Civilian Conservation Corps during the Great Depression. However, deferred maintenance within the park on historic structures such as the Hurricane Ridge Visitor Center, Lake Crescent Lodge and historic cabins and ranger stations has the potential to negatively impact visitor experiences. The frequent networking and communication between the park and the community that helps them deal effectively with road issues, algae blooms, and forest fires, will also be a key component in ensuring the millions of visitors to the City of Port Angeles and Olympic National Park fully and safely enjoy their visit. Bar Harbor (pop. 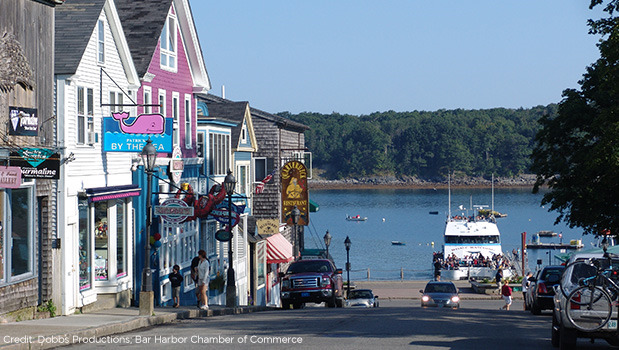 5,235) sits on the northeastern side of Mount Desert Island in Maine from the 1850s to the 1930s, Bar Harbor served a summer haven for the wealthy with grand-scale hotels and “summer cottages” (aka mansions) constructed during that time. View of Acadia National Park's Bass Harbor Head Light. 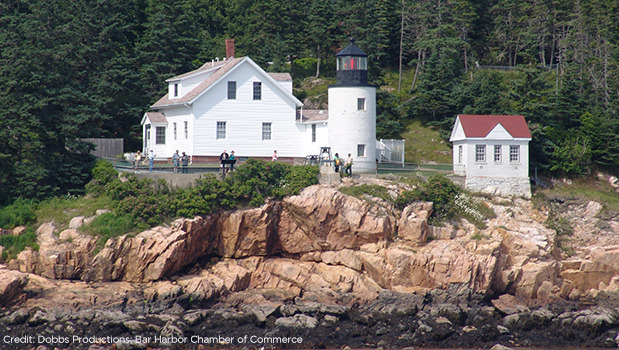 Today, Bar Harbor serves as the gateway to the magnificent Acadia National Park. Chris Vincenty, president of The Hub of Bar Harbor, the Main Street affiliate program, says that the park draws about 3 million visitors a year. Since their tourist season runs only from Memorial Day to Columbus Day, the number of people on the island can swell from 5,000 to as many as 50,000 people. Approximately 70 cruise ships dock, sometimes as many as three a day. The town struggles to maintain their infrastructure while providing visitor to the park all the services they need. After a decades long effort, the number of businesses who stay open year-round increased from 3 to 60. Looking down Bar Harbor's Main Street. A recent study shows that the park has pumped approximately $500 million into the local community. But when the government shut down during the fall foliage season in October 2013, the community lost millions in revenue. Not only is the park interwoven in the economic fabric of the community, it’s also physically intertwined since state roads run through the national park. If the park closes, it’s extremely difficult to find alternative roads to handle the traffic. A collaborative project by locals and the National Park Service to repair their historic carriage roads and stone bridges is underway. 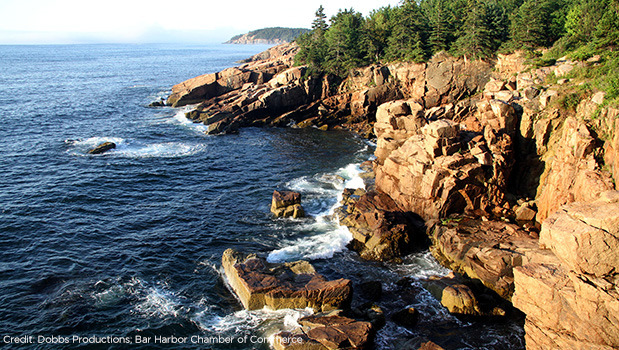 Originally financed by philanthropist John D. Rockefeller, Jr. for carriages, horseback riders, and hikers between 1913 and 1940, now forty-five miles of the fifty-seven-mile network of motor-free roads now runs through Acadia National Park. At an elevation of 7,935 feet, Granby sits on one of Colorado’s second largest body of water and offers breathtaking views of the Continental Divide. According to Gayle Langley with the Granby Chamber of Commerce, Rocky Mountain National Park “is our livelihood. We need the park.” With a population of 1,864, the town of Granby, Colorado is very dependent on the tourism dollars brought by visitors to the national park. Located on the less-populated west side of Rocky Mountain National Park, Granby supplies visitors with hotel accommodations, supplies, gas, restaurants, bars and the experience of touring a historic lakeside town. Tourism is an increasingly large source of revenue for the community. For example, the sales tax collected by Granby for lodging doubled from $55,360 in 2010 to $100,400 in 2015. The Total Sales tax has increased 40% over the past six years. Although visitation to the park has increased since 2011, the park’s budget has been cut. Such a situation places a great deal of stress on the national park’s resources and facilities. While National Parks are some of our nation’s most significant attractions, inconsistent public funding has resulted in a deferred maintenance backlog estimated to be about $12 billion dollars (FY 2015), of which over $3 billion is attributed to historic, non-transportation related structures and sites. This is why the National Trust for Historic Preservation has joined with the Pew Charitable Trusts and the National Park Conservation Association on a national campaign that seeks a reliable, dedicated federal funding source to address the deferred maintenance backlog. Together, National Parks and Main Streets work together to provide good visitor experiences. If the park’s structures are closed, not accessible or in good repair, today’s traveler has many avenues on social media to express their dissatisfaction which, in turn, can impact local economies. We work hard in our Main Street programs to keep the infrastructure of our communities looking its best. We need Congress to help our national parks do the same. Your organization can help by adding its name to a letter to Congress urging that they address the deferred maintenance backlog in our nation’s parks so that the public can continue to learn from and experience the stories that tell our nation’s history. ¹ The system includes 413 areas covering more than 84 million acres in every state, the District of Columbia, American Samoa, Guam, Puerto Rico, and the Virgin Islands. These areas include national parks, monuments, battlefields, military parks, historical parks, historic sites, lakeshores, seashores, recreation areas, scenic rivers and trails, and the White House. ² National Park Service, “Visitor Spending Effects,” accessed Aug. 19, 2016, https://www.nps.gov/subjects/socialscience/vse.htm. In her job as Director of Policy Outreach for the National Trust for Historic Preservation, Renee helps local advocates join the national campaign to increase funding for national parks to address their repair backlog.